How do you design a school library that will be more than a ‘book corner’? Designing Libraries takes a look at some innovative design solutions. Where am I going to put the library? 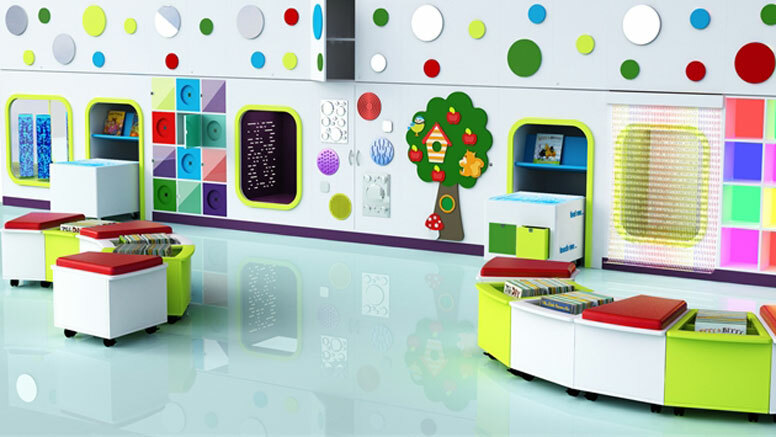 Schools often have difficult decisions to make about how to make the most out of both limited budgets and restricted spaces, and yet create a library that is modern, bright and attractive to children of all abilities and interests. Designing Libraries has been taking a look at some recent design innovations for school libraries that are flexible enough to meet a number of challenges. 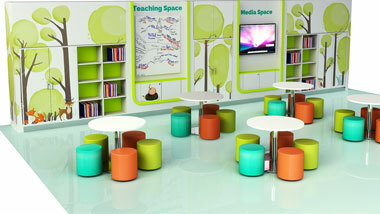 FG Library & Learning has come up with this modular approach to building a library space of any size. 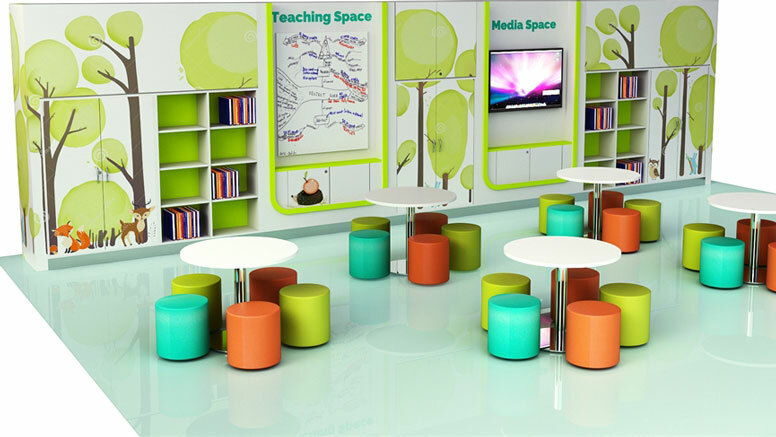 Units can be single or double-sided, so they can stand against an existing wall in a room or corridor, or they can form room dividers or compact interior library spaces, magical oases where children can read or study. StoryWall is an in-house design that is fully customisable with colours and graphics of your choice. Traditional storytime can be hard for children with special educational needs, and many librarians and teachers are working to change how they present books by using touch, music and movement. FG’s sensory StoryWall takes that idea further, giving children more ways to absorb and process information. Most children will readily embrace tactile learning and immersive storytime in an environment where they have plenty of opportunity for engaging in sensory play or imaginative storytelling. 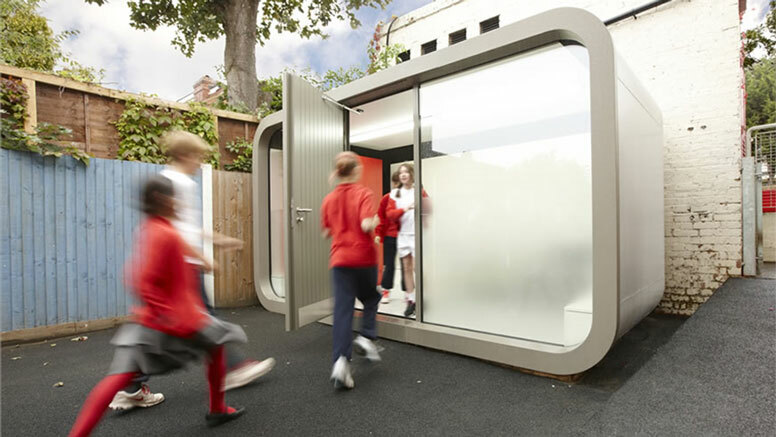 ‘Pods’ are a great way to create stand-alone discrete spaces in busy buildings. But here’s an outdoor concept that can be installed in a playground or other under-utilised area. It’s weatherproof and sound insulated. It makes a great library space, but it can also function as a separates study space, a music practice room, small group tuition room, art studio, or for careers advice and one-to-one meetings. The range of occupancy sizes offers a variety of options for location and use. Customisable library shelving and display. Oasis Sky contemporary outdoor pods.